When I first found out that I was expecting, I'll admit that I was unsure whether or not I'd express. Breast feeding was a no brainer for me for numerous reasons but expressing still seemed like one step further into the unknown. I was terrified of feeling (and looking) like a cow being milked and was just worried that it would all feel so uncomfortable for very little gain, surely I could just feed my baby myself until she started having cows milk? However as I've expressed many times here on my blog, pregnancy changes you, I want what is best for both my daughter and my family so whilst I want to feed Sophie solely on breast milk (until she's ready for weening etc) I'm willing to share some of the job with James and any other family members who want to give her a bottle. I soon came to change my mind on expressing, raising that it was actually a fantastic way to share both the feeding and the bonding that comes with that with James, it would almost be unfair of me to leave him out from feeding her as I know he's keen to do as much as he can. It also means that when visitors and family come round, they can feed her too should they wish. I think it's something quite precious to feed a newborn baby so it would be selfish of me to keep all of that to myself, plus I know that I'll be more than grateful for someone else being able to get up and do the occasional night feed! The next step was obviously to research into breast pumps, manual vs electric, single vs double, the possibilities seemed endless and I had no idea where to start. 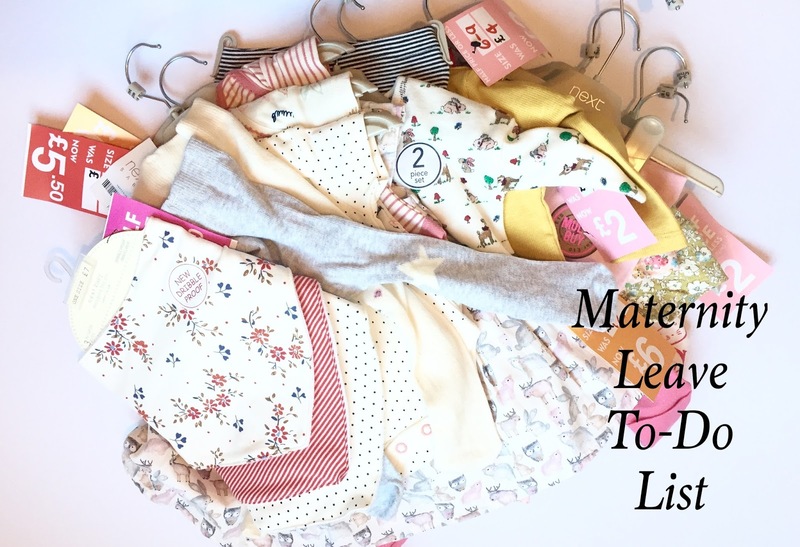 I shy away from the reviews that you see on the websites as I feel like you generally only see the negative so I turned to the likes of mumsnet and good old twitter to see which brands and models were the ones to go for. One name that kept coming up over and over again was Medela and the swing model seemed to be the best of the best. Easy to use, the most comfortable by far and the best results which is really what it's all about. The maxi version is the double pump meaning that you can really maximise what you express. We will be waiting until she's around 6 weeks old to introduce her to a bottle just to avoid confusion between that and breast however thanks to Medela, I am well and truly kitted out and ready for expressing! I actually let out a squeal of excitement when I received the email asking if I would like to be a Medela Mum, I never pictured myself having a "dream breast pump" but my Mummy brain took over and I was thrilled. My kit includes the Swing Maxi Pump for maximum expressing in the shortest amount of time, the Harmony manual single pump which will be great for either a small top up or for when we go away in July and as well as a bundle of other extras such as some Lanolin Cream, Steriliser Bags and Pump and Save Bags. I'm actually really happy that we received the bags for me to store my milk in as I'll admit we're using the Dr Browns bottles for feeding her due to their excellent reputation for reducing wind so it'll be super easy to transfer. As much as the bond that Sophie and I will develop through breastfeeding is second to none, I am thrilled to be able to share that with James as much as physically possible and I know that when I need a Mummy Break it will come in so handy to be able to leave her with someone and not have to worry about being back in time to feed her. Thanks so much to Medela for my package, watch this space for my breastfeeding diaries on how it all goes! So we've officially been "planning" our wedding for a month now, although nothing is booked and we're still quite new to this whole business, I feel as though we've already learnt loads that needs to be considered in those vital first steps of planning a wedding. Set a realistic budget - It may seem a little early to talk money but there's really no point in visiting your local stately home and verbally inviting everyone you come across in the street if you need to do the whole thing on a shoestring budget. We've not actually spoken numbers ourselves (so I may seem like a huge hypocrite) but we both have a grasp of our joint financial situation and how much we can justify spending on various aspects of our day. Talk numbers - I'm talking head count rather than money here, as soon as he pops that ring on your finger everyone that you've even spoken to, friended on Facebook or said "Hi" to briefly at a mutual friends party will be wondering whether or not to expect an invite. It kind of does go hand in hand with your monetary budget but also think of it in terms of who you want to spare such a precious day with. If you want (and can afford) it to be a spectacle for all and sundry then spread the word far and wide and don't be afraid to band around verbal invitations like they're going out of fashion however if you're like us and want a more intimate affair then be selective with who you promise an invite to, it's hard to explain uninviting someone! Sort your priorities - Unless you're made of money then you'll probably have to compromise on some aspects of your day. I think it's wise to have in mind from the get-go what's of paramount importance and what can probably fall by the wayside. Similarly with things getting booked up. If booking a particular photographer will make or break your day, then set aside the pennies and secure that date as soon as possible. Also making sure that you have the same (or at least some similar) priorities will save on future arguments. If you want to invest all of your money in your dress but he's all about the venue then you need to iron out who is going to win what battle! Research, research then research some more - Before James proposed I thought I knew exactly what I wanted for our big day and that it would take very little planning at all however now that I'm actually starting to look into things my mind is blown. I could stick with my original plan however I want to embrace our engagement and make the most of the beautiful invention that is the internet. I personally recommend getting out there and going to Wedding Fairs to physically see and touch what people have to offer. I was certain that I wanted a strapless A-line dress and nothing else could possibly suit me however now that choosing my actual wedding dress is looming I'm open to trying as many different styles as possible. Similarly with styles of venue, I want to see everything that the wedding business has to offer and then make my choice. You only get engaged once (or at least I intend to) so why not indulge yourself in it as much as physically possible? 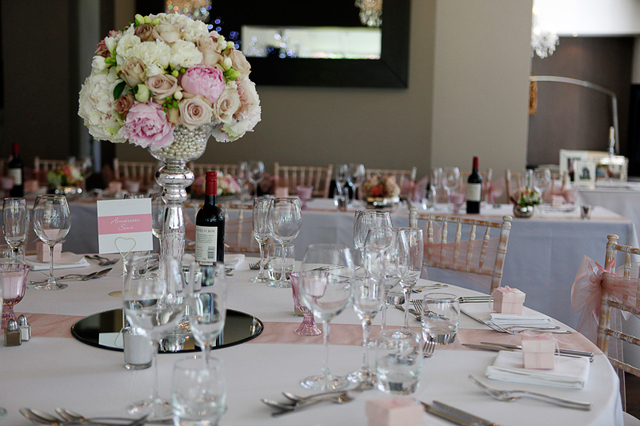 Set a realistic time frame - Get engaged over Christmas and want to get married this summer? Fantastic! Also want it to be a grand £100 a head "do" for everyone you've ever met but can only spare enough for your immediate family down the pub this side of 2020? Then you're going to have a problem. I don't want a particularly opulent affair but I do have in mind that I only intend on doing this once and don't want to scrimp too much, so we've been realistic and set an ideal year of 2018. That gives us two years to save and decide what we want and also hunt out as many bargains as we possibly can! If you've not got the funds behind you then be mindful of how much things cost and factor this in to your timings. You can always bring it forward a year if you find that you're able to afford it more quickly but moving it back may be more tricky and will almost certainly be more heartbreaking. Think about you - I can see this one being a little controversial however it's something that, to me at least, is pretty important. I obviously have some baby weight to lose and I'd ideally like to be a dress size smaller than I was pre-pregnancy so I have factored this in to my wedding plans. If I were to get married this summer then I either wouldn't get to my "goal weight" or would have to not quite look how I want to so another reason for choosing two years time is to give myself the time I'll need to comfortably drop two dress sizes. I don't believe in fad diets and would rather not starve myself for the sake of one day and then balloon again before I've returned from my honeymoon so I want to lose weight at a healthy and mountable rate. Similarly with your skincare, they say to start your Wedding Skincare Regime the day that you get engaged. As a beauty blogger obviously my skincare regime changes constantly with the arrival of new products and trialling things for reviews however the principle is essentially to not solely use face wipes and E45 and then have a full facial the day before your wedding and wonder why you'll more than likely break out. Find a routine that you can stick to for at least 3/4 months on the run up to your wedding and try not to introduce any new products or procedures in the month before (I've known spots linger for a long time). Home or Away? - I think deciding the geographical location of your wedding should be done as early on as possible. We're quite set on having our work friends to the evening do only so it's important to us to stay fairly local however personally I think you need to give people as much notice as possible if you're wanting them to travel. 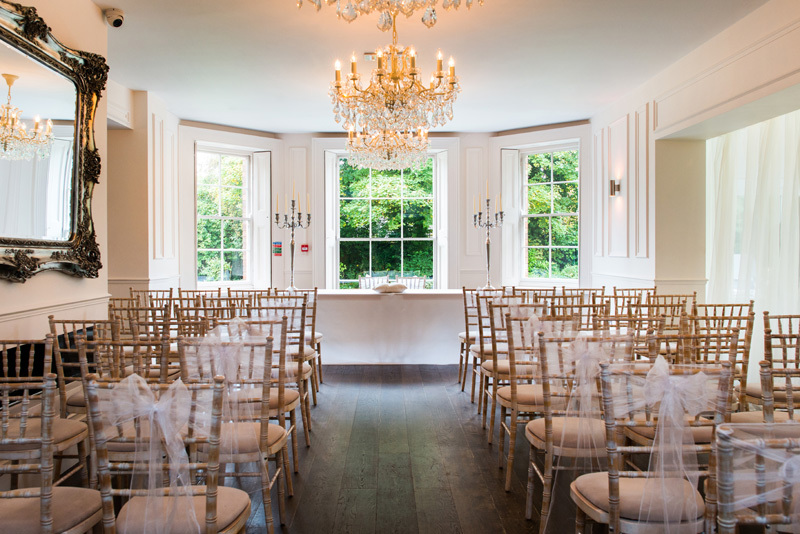 If you live in Newcastle but it's important to wed in Cornwall and you want people to be able to attend then you need to take into consideration that they'll need at least two nights accommodation (not something all wedding only venues offer) and similarly a minimum of three days off work. If you're going abroad then obviously you need to give people even more notice to save and book the appropriate time off otherwise, be prepared to have people who can't attend. Use your skills and time wisely - If you want your wedding to be adorned with homemade decorations and trinkets then think about things realistically in terms of both cost (sometimes it can be cheaper to actually just pay for someone else to do it in the long run) and time. I'm in the fortunate (some may say) position that I've got the next year off to devote to my darling daughter and also planning and organising our wedding. I personally want to make our wedding invitations and favours myself. At the moment I'm thinking of little jar candles for the favours and something a bit rustic (to hide any mistakes!) for the invites but if you're like my sister who works crazy long hours, is doing a degree, moving house and hits the gym hard and often, you could well burn yourself out and be left with lack lustre offerings because you couldn't devote the proper time to it. I don't think Hannah did a lot herself in terms of DIY and didn't even do her own flowers in the end (she's a trained Florist) as she just didn't have the time and didn't want to let her big day down. Essentially the theme is realism. We all dream of Kim and Kanye style affairs with string quartets and walls made from freshly cut roses but if you're realistic with yourselves from the start then you won't be setting yourself up for a fall. Budget, Time and the skills of yourself and others are things that you need to work out early on for as smooth of an engagement as possible. Don't expect too much of yourself, your fiancé or your money but be firm about what's important to you. We all only intend on doing this the once and we can't all re-new our vows as often as Katie Price does so make it count, make it you and make it your kind of special. If there is one thing that never fails to brighten up my home it's fresh flowers, I've often toyed with the idea of buying silk just so that I can have them on display permanently but they're just not the same. When I was offered the chance to receive the beautiful Sofia Bouquet from Bloom & Wild Flower Delivery I jumped at the chance, I chose the Sofia in honour of our baby girl, Sophie and they are just as beautiful as she is (okay maybe not quite, but she is jolly beautiful!). If you haven't already heard of Bloom & Wild then they are a flower delivery service but with a big difference, the flowers are packaged so that they will fit through your letterbox. Perfect if you want to send someone flowers but avoid the extortionate charges that some companies add on for a timed service. We were actually in when these flowers arrived and I had a couple of other parcels being delivered so our Postman actually knocked on the door to give them to James however we have checked and had we been out then they would have fit through the letterbox no problem. My only tiny reservation is whether or not my Dog would rip open the box but that's definitely my issue and not theirs. He seems to like sweet smelling things as my The Melt Crowd boxes always used to get chewed - don't ask. 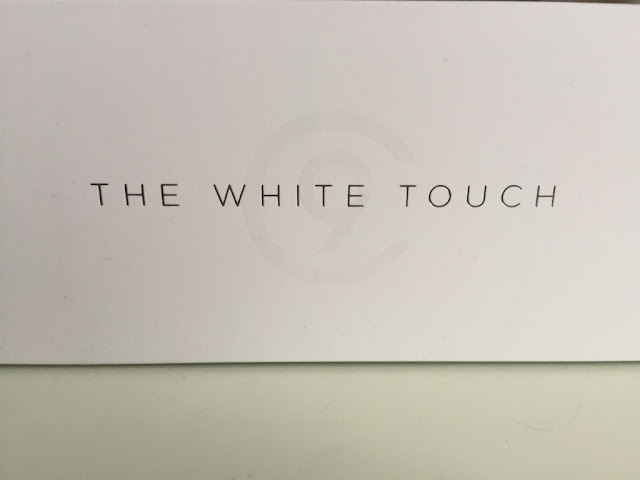 The packaging itself is as stylish as it is sturdy which is essentially everything that you would want in packaging! The roses and lilies have individual netting to protect them from any harm and obviously all of the flowers are laid flat. James did say that he didn't like the fact that they had to be arranged once they arrived but what does he know?! Even flowers delivered by local florists need a bit of titivating and I for one enjoy putting them all where I want them. Another service that Bloom & Wild offer is a monthly subscription service which is something that I am really interested in. As I said previously I love having fresh flowers in my home but never get round to buying any, or when I do come to do so I get put off by the price. The longevity of the flowers that I was sent (they lasted weeks) and the ease of signing up to a service that will pay for and deliver them for me once a month (you can choose weekly or fortnightly deliveries too should you wish but these last so long that I don't really think you'd need them any more regularly). I'm not sure if I can justify it whilst I'm on maternity pay but as we're looking to buy our forever home next year it's something I am without a doubt signing up to then! I know that my Grandma definitely deserves some flowers sending to her (although she doesn't have a letterbox, she is generally always in to receive parcels) after she's been so wonderful throughout my pregnancy and I know that Bloom & Wild is exactly where I'm going to go for her. They currently have 9 different bouquets to choose from (some are slightly more expensive but they're all around £20/£30) so there's something to suit all tastes. I think I'll go for The Sienna next time as the colours are beautifully bright for Summertime. BabaBing! DayTripper Deluxe Changing Bag £39.99 - I struggled massively when choosing my changing bag, I really didn't want something too girly as I'm not a huge girls girl myself and you so often see Dads out on their own with a changing bag covered in pink bows looking ever so slightly embarrassed. James himself said he didn't care either way and I'm sure many men don't but no, I wanted to have something unisex that anyone would feel comfortable using. I also really wanted one that would compliment our dark grey travel system and as I said previously, I'm not massively girly myself so hearts and flowers just aren't my thing. I did however want something slightly nicer than a boring black and the Mamas and Papas offering that went with our Travel System just seemed like a big handbag and not particularly practical. Another thing that shocked me was the cost, don't get me wrong I've spent more than my fair share on handbags before but part of me wanted to just buy a quicksilver school bag (we all had one and know how vast they are!) and chuck it all in there. Anything that was garish and bright seemed to cost an arm and a leg which I just couldn't justify. After what seemed like days of searching the internet high and low I finally came across this BabaBing DayTripper, it actually says on some websites that it's a paternity satchel (what they different is I don't know) but on their page it's called a changing bag. I can't remember where I bought it from in the end as there was varying offers on various different sites not long after Christmas but the price seems to range from around £55 to £39 and I know I didn't pay top dollar for it. Upon unboxing the changing bag I was a bit nervous that it was too small, I think in hindsight it's just ever so slightly stiff and will give way in time as we need to cram more in there but we've actually managed to fit a lot in there! It comes with so many pockets that all have little pictures of what to put where, which not only should mean that James puts everything back in the correct place, it's a nice easy reminder that you've got everything you'll need. 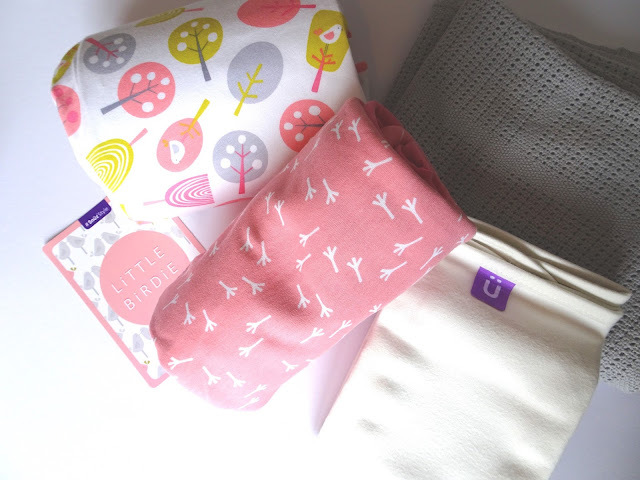 An empty pocket will quickly show you what's supposed to be in there so you can replenish the stocks before leaving the house without any clean nappies or wipes! It's also got a cooler part that is insulated, presumably for if you're formula feeding and want to make one up before you leave? But will also be perfect for snacks and/or juice as and when the time comes. There's external pockets too for things you may need to reach for quickly. Oh and it comes with it's own foldable changing mat, perfect for being on the move and the inevitable having to use a public changing room. It does have a specific drinks cooler but I took that out (a great feature is the fact that you can take things out that you won't need), obviously I've kept it for the future but when she's breastfeeding to begin with I'd rather save the space. We've currently got it all packed ready for when we head to the hospital to meet our new arrival but I'll be doing a separate video to go through what we've put in it so far but I cannot wait to start using this all of the time. At the moment it's sitting beautifully in our nursery until I get my bum in gear to film the "What's in my changing bag?" video and then it will go into the car for a quick getaway when the fun really starts! The White Touch by Cloud Nine £99 - Firstly apologies for the rubbish photos, it's harder to photograph Hair Straighteners than you might think and these pictures are actually months old now. 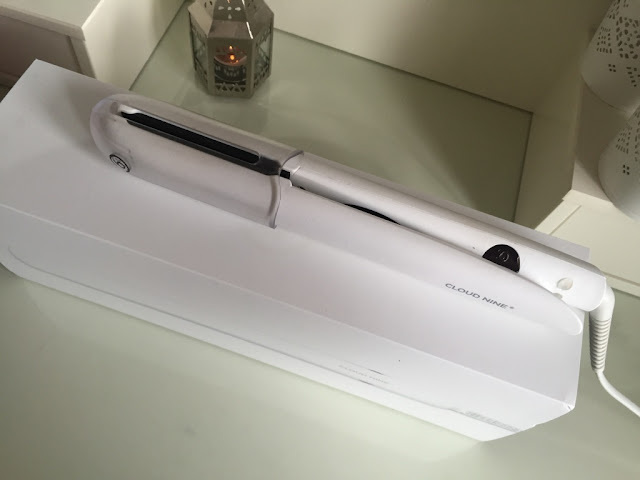 I've been debating whether or not to post this review as I don't actually own this model of hair straightener any more but they're quite different to your normal GHDs so I thought I'd give them a quick mention. The main difference is that they are touch sensitive, meaning that all you need to do is "clap" them together for them to turn on and they'll start heating up straight away. If you then don't use them for 30 seconds then they'll start to cool themselves down and turn off, this means that obviously you can't leave them on by mistake but I've spoken to quite a few people who have admitted they wouldn't trust them to turn off by themselves (just in case) and so would turn them off at the plug each time you were totally finished with them. It does sound great in principle however if you're having a bad morning then the costing beeping of them turning themselves on when you put the plates together and then beeping again because you've not been quick enough to separate your next piece of hair and they're turning off can actually get a little annoying. I think a 60 second timer would have been better personally as particularly when curling my hair, 30 seconds is not long enough for me to prepare the next section of my hair. 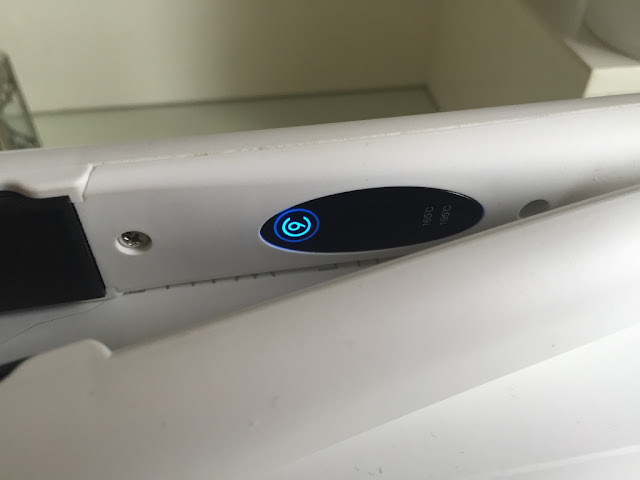 You can also close the irons together twice in quick succession to change the heat setting which I personally never did as I just don't find the cooler settings on Straightening Irons effective in my hair, but does make them more versatile. 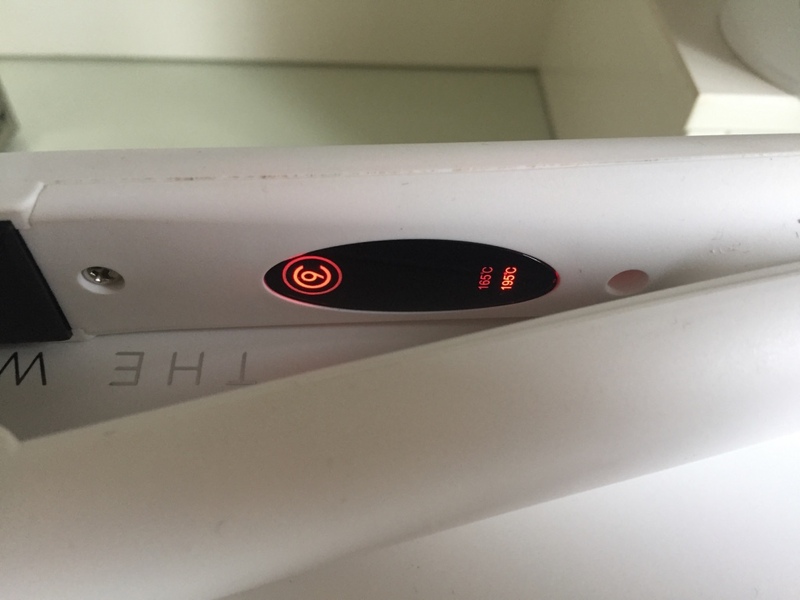 Now I do have to say, I started using these in September of 2015 and the first week in January 2016 they broke, it just so happens that it was when we cleared out our dressing room to transform it into the Nursery but after trying several plugs in the house they just did a continuous beep and never heated up. Annoying yes but I understand that the more technology you put into a product, the more likely it is to go wrong and there may have been teething problems so I would never hold a one off thing against a company. It irked me slightly that it took Cloud Nine over a week to get back to me and two attempts to send me a returns bag but possibly more so because I had literally just thrown away my old, but still functioning GHDs so I'd left myself completely straightener-less. I will admit that I was sent a replacement within the next week which was a lot faster than I was expecting, however was disappointed that I received no correspondence in the mean time to say what the fault was or what action they were going to take. They didn't send me a like-for-like product back either, instead they sent back their "The Original Iron" which they say it a superior product (and does cost £30 more) but I personally really don't like them. To me the quality of the actual iron isn't as good and it doesn't glide through my hair anywhere near as easily as The Touch did, plus the curls I do put it don't seem to last as long. It's your usual Iron with an on and off switch however you can control the temperature. That's great for people with fine hair but for my thicker tresses I always need it on the highest setting yet the Irons don't have the function to remember my last preference (The Touch either did, or automatically went on to the highest each time), meaning that many a time I'll quickly flick my straighteners on only to go to use them a minute later and find I've forgotten to bump the heat setting up two notches and then have to wait another 60 seconds or so for them to reach my optimum temperature. Oh and they just don't look as pretty either. I don't think that Cloud Nine particularly did anything wrong and I'm sure they had the best of intentions but now I feel as though I'm stuck in a situation where I have to invest in more new straighteners (and will be going back to GHD) because the replacement that they sent me just doesn't work as well as I want or need it to and the fact that I wasn't asked kind of bugged me. Many people will have chosen a certain model for a reason and I think to just send back something different without even offering the choice is a bit bad, it wouldn't take much for an email to say "we've found the fault and are replacing your irons, would you like the same model again or we can offer you x instead which we feel are better for z reasons" and then people can choose themselves. It comes across that they have identified a wider issue with the Touch model and are steering away from sending them back and felt as though they obviously have no faith in them, which leaves me with little faith in the Irons that I do have and is why I will now try and save up for some GHDs (probably never going to happen on Maternity Pay but they can go on my birthday list!). I also need a curling wand and have looked at the Cloud Nine offerings but again, I'm now dubious. For me, The Touch irons were fab, they heat up quickly, I personally didn't have a problem with trusting them to turn off on their own and they looked beautiful on my all-white dressing table. However I am now without my Touch Irons and kind of really wish I had them back! The Gro-Egg £21.99 - I'll just start this review by quickly saying I did not pay £22 for my Gro-Egg, I managed to get it off of Amazon for around £15 and they're usually on offer somewhere or another so it's worth having a little hunt around if you want one of these. Moving on from those quick words of advice, I am a natural worrier. I worry constantly about money, time, lack of time, being bored, enjoying myself enough, being healthy, being active so it's only obvious that I would be one of those Mummies who was sucked in by anything and everything that came me some sort of peace of mind that Baby Wood was okay. I had worried about knowing that she was warm or cool enough as babies can't regulate their temperatures like we can and the heating in our house seems a bit hit or miss depending on which room you're in. The Gro-Egg is a digital thermometer that displays not only the temperature but also changes colour to alert you quickly to if the room is getting too cool or too warm as well as a little smiley face just in case you were still unsure (sometimes when it's changing from yellow to blue it can be hard to tell which one it really is). It's fantastic to be able to just walk past her bedroom and see at a glance that she'll be sleeping in a comfortable temperature, we've become a little obsessed with looking at it if I'm honest! The soft glow of the egg could also act as a night-light however for us we think it would be too dim, possibly if this was right next to your baby's bed or they didn't need much of a light at all but as this is actually on the opposite side of her room for now (although I'm considering changes things around even at this late stage) then it wouldn't really make any difference so we've bought her a separate night light. The thing that really sold James on the Gro-Egg however was the customisable characters that you simply pop onto the top of the Gro-Egg to personalise it for your little one. I chose Orla the Owl to match in with her Woodland Themed decor in her nursery but there's also Percy the Penguin or Mikey the Monkey depending on what you think your little one would prefer. These are extra (and I can't remember exactly how much I paid for ours again) but they're not vital for the Gro-Egg to work so could be purchased later and I don't seem to remember it costing more than around £8. Plus it adds so much to the look of the Gro-Egg that I just couldn't resist. It's yet another wonderful invention from the Gro-Company that I don't think I could live without, every time I visit their website I see something new that I just know will change our lives with Little One. Last Saturday James and I thought we were actually going to rule out a potential wedding venue, James thought that from the photographs he had had thrust under his nose that The Old Vicarage looked like a normal detached house in the middle of an ordinary village and was not overly impressed. I, on the other hand, have been in love with The Old Vicarage ever since my previous Manager married there in 2012 but knew that this has to be one day that is about both of us so almost went to say goodbye to my dream. 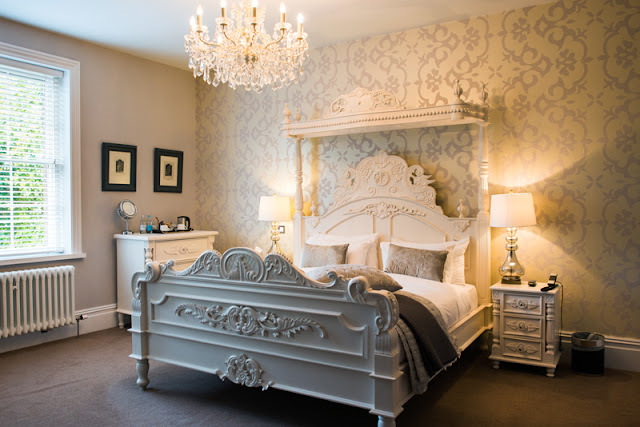 I have to say I was a barrel of nerves as we approached Southwell, especially after we had been rather underwhelmed at Doddington Hall the weekend before and James has expressed an interest in a converted barn, not a boutique hotel. We were greeted by one of the Wedding Planners and much to our surprise, then left alone to have a wander round. Everywhere was open to be investigated and it felt so laid back I just breathed an instant sigh of relief. James is not one to be sucked in by the hard sell and the guided tour we'd had the weekend previously did nothing to sell the venue to us so we were grateful to be able to wander around the Vicarage at our own pace (which is obviously rather slow for me these days), make up our own minds and form our own opinions. We didn't have to try and second guess what the other person was thinking for fear of upsetting someone within ear shot who worked there and also didn't have to try and hide our excitement in case someone felt that they could take advantage. We could suggest things to each other, express what we liked and what we would have different openly which made the whole process so much less stressful. I was also able to ask him freely if we could get a quote without worrying about him feeling pressured into saying yes in front of a Wedding Planner, in which case I wouldn't have asked him at all and we'd have gone away with little more than we came. The staff at The Old Vicarage were mingling around so you could ask any questions that you required and they also provided canapés (we could have had a glass of fizz but with me in my condition and James driving meant we both declined, but it was a nice touch) which were beautifully tasty and they personally went to check with the chef which ones I could and could not try being pregnant. The quote also felt very relaxed and at no point did they mention booking or trying to secure a date that day. I was half expecting to be told "ooo we're getting full for that time of year" when we said ideally when we'd like to get married but there was none of that and also was pleasantly surprised to check my emails the next day and see that they hadn't followed us up, nothing bugs me more than pushy people and especially with our wedding, we will not be rushed. We are, essentially, at the stage of merely wandering around venues to get a feel for what we want before we make any decisions as we won't marry until late summer 2018. I want to really cherish and enjoy our planning process so we won't make any decisions for a few months yet but I have a really warm feeling about The Old Vicarage. It's a smidgen out of our price range at the moment but as I just said we're taking our time to find the best option for us possible. All photos are courtesy of The Old Vicarage as I was too excited to take any on the day! 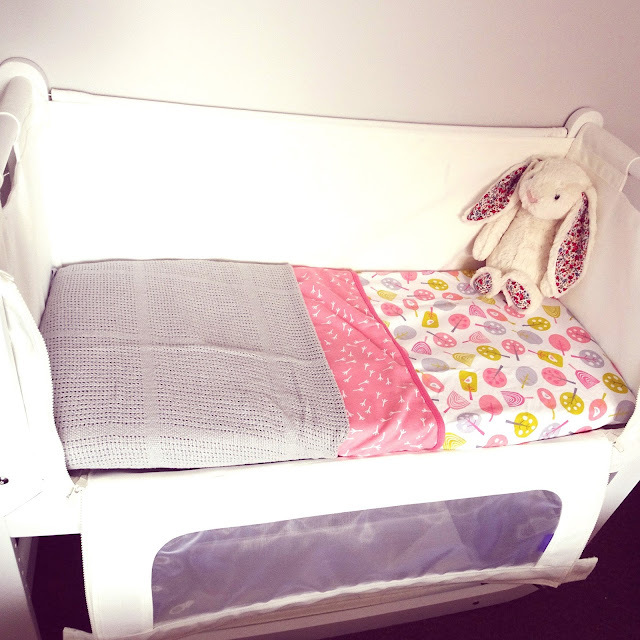 The first job that I did on my Maternity Leave was dressed my beautiful SnuzPod. Every night I go to sleep grateful that I took the plunge and purchased this co-sleeper above all of the others - it's just so stylish and sleek. It was starting to irk me slightly that it was a plain mattress with no bedding so on our last foray to Kiddicare we decided to pick up the beautiful matching bedding set to dress our Snuzpod properly. Our bedroom is actually all grey and white so I was leaning towards the Cloud Nine collection to keep it all tied in nicely, however I am so glad that James convinced me to purchase the Sweet tweets set instead, our Little Girl deserves a bit of pink in her co-sleeper and it actually makes a nice, bright change to our bedroom. The cellular blanket obviously won't stay tucked into the end of the bed, we plan on swaddling her in that for the first few weeks until she's big enough to use either the blanket or a grobag (Although I'm not sure a grobag will fit in her SnuzPod so we'll have to play that one by ear!). I've finished the co-sleeper off with her Jellycat Rabbit that I was thrilled to buy her, I love Jellycat and I really want this rabbit to be her go-to comforter, although I know you can't force these things on babies, it still looks cute in there for now! We got the three piece set for £34.95 as it actually worked out the best deal in our eyes and means that we have a spare bottom sheet. We also picked up two plain white ones just in case of emergencies but I'm going to show you all our "emergency basket" another day. 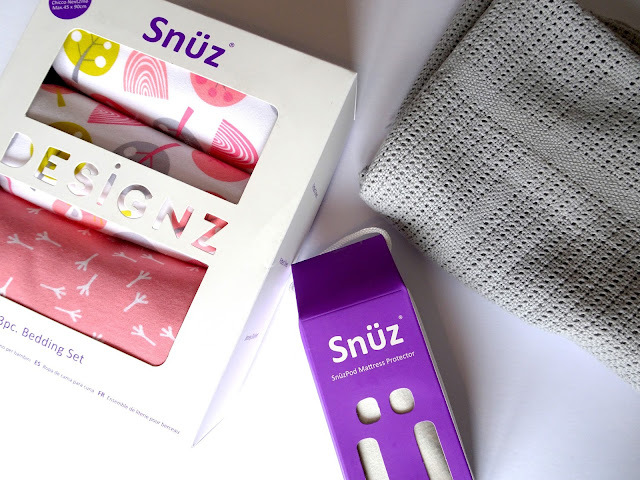 The only other thing we purchased for our SnuzPod was the mattress protector, a vital investment in our eyes! We didn't go for any of the pockets etc as considering where it'll be placed, we just don't have a need for them and everything we will need (or so we think) goes in her basket underneath. This Snuzpod just looks like perfection now in my eyes, every morning when I wake up it's the first thing I see and I just can't wait to place my beautiful baby girl in there and be able to reach out and comfort her whenever she needs me. It really is my favourite piece of furniture that we've bought for Little One and I can't tell you how thankful I am that we chose this one above all others. So I am officially on my maternity leave, I left work 5 weeks before my Little One is due quite simply because 1. I could and 2. I couldn't handle it anymore. My job isn't one that can be done part time and it would be a strain on my office for me to continue taking half or full days as holiday and a full Monday - Friday working week was quite simply too much. So, as of last Friday, I handed over all of my accounts and left to be a lady of leisure for 5 weeks before we're graced with our new bundle of joy and the real hard work begins. Although many will think I've essentially got a 5 week holiday and that I'm over prepared, they would be wrong. I have so many odd jobs around the house that need to be done, TV shows to be caught up on and things to keep my physically active that I doubt I'll get bored too quickly. 1. Washing - As with most expectant Mothers, I have an urge to wash all of my Little One's clothes before she get here. I actually need James to clean our washing machine filter before I'll do this but as soon as he does her Muslin Cloths, Clothes and Bedding will all go through a nice wash ready to put organised and put away properly. 2. 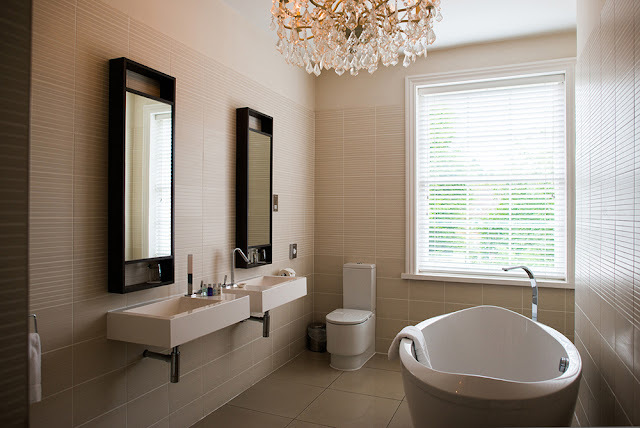 Cleaning - Obviously my house needs a good clean, not because I haven't cleaned it in a while but every now and then I have a good deep clean and if I'm honest I've been putting it off for a few weeks until my Maternity Leave. Places that usually get overlooked such as beneath the drawers and behind the sofa will get a jolly good hoover and the bathroom will be scrubbed within an inch of it's life! 3. Sorting the Wardrobe - Something that I actually did back in December/January already needs to be done again. Obviously I hope to be coming out of my maternity clothes soon so I need to prepare my normal ones back to be worn again. There are certain things that I know I won't wear once I'm a Mum (that lovely white Jack Wills jumper may be a risk too far) and so will be popped on eBay to earn a few extra pennies. 4. Sorting James' Wardrobe - When he lived with his parents, James essentially rotated the same clothes straight out of the wash and I don't think I ever saw him reach into his drawers to get clothes out as they were never put away. Obviously he doesn't get away with that anymore but what once was an organised chest is now quite frankly a mess. He doesn't particularly care and you could argue that it's his clothes so neither should I, but I like things to have a place and as I'll be doing all of the washing and ironing for the foreseeable, I want to know where I'm putting it and eliminate him rooting around in his drawers in the early hours of the morning because he can't find his socks! 5. Scheduled Posts - Obviously I don't want this blog to become totally neglected once Little One is here, so I've already started scheduling a couple of posts for around when she's due. I'm enjoying being able to post ad hoc at the moment so will try and keep that up until she gets here but I know it'll be a while until I will have time to sit down and write so I need some content to keep things moving! 6. Youtube - I adore doing YouTube but when I'm working full time I simply struggle to find the time. Our house is basically too small and noisy to film whilst James is around (and he'd only laugh at me anyway) and we've ben really lucky to have loads of weekends together recently. I'm actually looking forward to a few days with the house to myself to sit and record some YouTube Videos to try and ignite my venture into that world. 7. Swimming - As I said in the intro, I want to try and keep physically active as much as possible. I'll admit I'm going swimming on my own for the first time in a while today and I'm a bit nervous in case anything should happen but it's important to me not to lose the last bit of fitness that I have left before she arrives. I'm also so keen to get active after she's born so I'm hoping it may give me a head start. 8. Walking - Much as above but with the added bonus of having some quality time with my dog. He's been the focal point of my life for his whole 7 years and the whole situation is already freaking him out a bit. I know he'll love just having me around the house but he'll really appreciate some lovely long walks rather than quickly being nipped around the block when we have spare time. I know he won't get half as much attention as he's used to once she's born so I think it's important to make him know he's loved. 9. Scrapbooking - I'm not talking about those Project Life things that everyone got really into and essentially created a hard copy of their instagram feed like a year or two ago. If you didn't already know James and I got engaged in January of this year and I'm really enjoying planning our wedding. I know that the venue visits etc will cease for a while once Little One is born but I can still read through my magazines for the odd quiet 5 minutes and do what I can to start piecing together what we'd like for our big day. 10. Sorting out my MacBook - I'm terrible for never deleting files from my MacBook, I actually did my emails this morning which felt great but I still need to clear down my MacBook and organise my documents and pictures. Nesting in 2016! 11. Catching up on Netflix - It may sound a bit indulgent but I actually really want to catch up on House of Cards, Once Upon A Time and Mad Men before baby arrives, I know that binge watching Netflix shows wrapped up in a duvet on the sofa will be a thing of the past once we've got our bundle of joy to look after so I want to enjoy it whilst I can and get as caught up as possible! 12. Stock Pile on Food - Another thing that I doubt we'll have much time for in the beginning is cooking good meals from scratch, as I'm conscious of my weight already then I don't want to rely on take aways and fast food so we've already made a bit of a head start on batching cooking and freezing portions for us to simply defrost and microwave when we're short on time. Feel free to give me some ideas of good meals to do this with as at the moment they're all minced based! Why I Disagree With "Period Leave"
So I was happily laid down in bed ready to drift off to sleep when all of these thoughts surrounding the newly announced "period leave" came swirling around my head for the third time today. You may say I'm in no position to comment on periods or their impact on daily life seems as I'm 35 weeks pregnant and as such haven't had a period in nearly 9 months, however quite obviously my menstrual cycle was in full swing before conceiving and had been for over 11 years so I've got some experience on the matter! I'd be lying if I said I hadn't had the cheeky day off of school or sixth form because of cramps or just generally feeling like crap around that time of the month, but I can hand on heart declare that I've never taken the day off of work for it. I've been quite lucky that only the first day is really a problem and after that first early night snuggled up in bed I'm usually okay for the rest of the week and I'm well aware that there are many women out there in very different situations to mine. In which case, I would advise seeking medical advice from a Doctor to see if there is any intervention that can be offered to ease the symptoms. What I can't get my head around, however, is if for instance you are diagnosed with menstrual symptoms so bad that they stop you from working, how that is any different to another illness making you sign off sick and why you should get treated (and more crucially, paid) any different. These leads me onto my first point, I have a heart condition that can mean even a nasty cold can knock me for six and I can genuinely struggle to function. However when I took a day off sick for this reason, the fact that it was a recurring medical condition made no difference to the fact I'd called in sick and I got paid sick pay accordingly. I know and work with people who have much more frequently recurring medical issues that stop them from coming into work but they aren't granted paid leave for this. Why should an excessively bad period (for whatever reason that may be) be any different? You're basically calling in unfit for work, the reason behind that should be irrelevant in terms of your pay and sickness record. Secondly, then comes the people (and we all know at least one!) who will abuse the system, an employer is not going to ask you to prove that you're on your period, nor can they prove the severity of your cramps nor the heaviness of your bleeding so does this not leave the scheme wide open for people to take the p*ss? Those who would wake up to find that they're on their period, probably not need the day off of work (I'm talking about someone exaggerating and abusing the leave here, not those with genuine reasons FYI), but call up to cash in their "period leave' anyway? Or, as I stated earlier, as an employer can't actually prove when you're on your period (not everyone has a regular 28 day cycle), ladies who aren't even experiencing their time of the month at all but just fancy a few days off! To me it seems wide open for abuse and not only is that unfair on the rest of a workforce, it actually undermines ladies who really do suffer. Bringing me nicely onto my third concern which would be the potential for a social stigma within the office. I'm not going to go in with the angle of how it could be deemed unfair for men because, at the end of the day, they don't have periods, although I will touch on them a bit later! No, the stigma I'm talking about is the us v them amongst the females. You're kidding yourselves if you think that there won't be a divide in an office between those ladies who take the period leave and those who don't feel the need to. I know people who would rather sit at their desk with a hot water bottle and whince their way through the day because their workload is too huge to leave for a few days a month and because they don't want to be "that girl" and I also know people who would have the attitude of "well I manage to cope okay so why can't so-and-so?!". Now you & I both know that no two periods are the same, hell I myself have had some that have left me bed bound and glad they've reared their ugly heads on a weekend so that I don't have to miss work and then another month barely notice I've come on. However that doesn't mean that everyone out there is as educated or even polite. I've experienced being compared to many other women during my pregnancy and know that I've been criticised when my back is turned for how much physical activity I've done or how early I've taken my maternity leave, so don't kid yourself for a second that it wouldn't happen with part of a workforce embracing and using the period leave whilst another half carried on as normal throughout all weeks of the month and that it wouldn't cause animosity. Fourth on my list of concerns is obviously employability. You don't need to tell me that we're in 2016 and it's illegal to not employ someone just because she's a woman, but I don't need to point out to you that it most certainly still happens in some cases. I myself have been for interviews and known when they ask whether or not you have children, they're actually fishing for your reaction to gauge your likelihood of disappearing on maternity leave for a year. I'm in no doubt at all that there are some employers out there who would be really put off employing women if it meant that they had to give them paid time off every month. We're supposed to be closing the gap with regards to attitudes towards gender within the workplace and I think this would be creating a whole new canyon. Would period leave have to go down on your sickness record and you'd therefore kinda have to declare it any future job interviews? 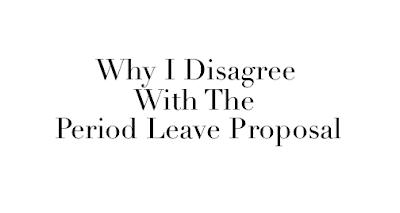 Would an excessive list of "period leave" make you less likely to get put up for a promotion vs a male employee or a female who never took a day sick? Fifth is the time/pay aspect. Would you be expected to work longer on the days when you were able to work? 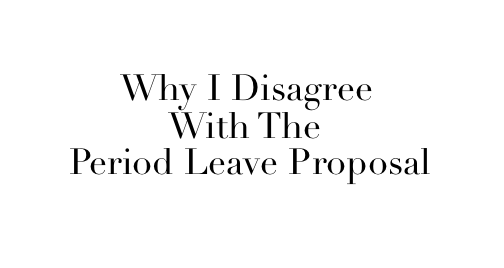 Would your pay be docked for period leave (I've read that it wouldn't)? And if someone was needed to stay late or work a weekend/bank holiday, would you be expected to step up to do that? Where I currently work, they're very good at the more you put in, the more you get out. You can take the odd long lunch here and there if you've proven to put the time in beforehand although we're talking an hour here and there, not a whole day or two. If I were to take one day off, I'd have to work 2 hours extra per day for the rest of that week to make up my time. Again I think there'd be a divide amongst the ladies who did take the period leave between those who made their time up out of principle and those who took it literally and didn't feel the need. My sixth concern is actually that it would pull us further apart as women rather than push us together. Would it not basically highlight those ladies who didn't have periods at all for whatever reason? Be it a medical reason or because they're hitting the menopause, or any other reason, would it not single those ladies out? I know that I myself would feel really conscious if for any reason my periods were to stop and it become obvious because I suddenly cease to take period leave. It was hard enough for me to keep my pregnancy from work for the 8 or so weeks that I did and I would hate to have felt pressured into telling my boss earlier because they'd noticed a change in my monthly routine. The rumours of "she normally always takes her period leave and she hasn't for the last two months, I bet she's pregnant" would whirl around any office in the country faster than you could stop them which could cause upset for so many reasons. Many ladies also are embarrassed to start the menopause (not that I think they should be embarrassed, but it's a fact that many are) and may feel awkward that it was obviously starting to happen to them when they no longer needed period leave. I can't believe I've actually got seven whole reasons against it, but here is my seventh... much the same as the troopers who never even bat an eyelid at their time of the month, what about the ladies who have been there, done that and are now beyond having periods? Again as a pregnant lady I've experienced a lot of "we managed fine in my day" and I think it'd be exactly the same with period leave. They coped fine without it and so should the next generation, why should we be treated any differently to how they were and get it easy?! Now I am not for one second saying that I agree with any of the above happening, many of them are down right wrong and shouldn't even cross people's minds. In an ideal world everyone would take it as the helping hand that it was intended to be and only those really in need would reap the benefit. However in a really ideal world, no lady would experience periods so bad that she felt the need to be off work and periods would be exactly how they advertise them on the tampax advert. I just happen to live in the real world, call me tainted from years previously spent in the motor trade surrounded by men telling me I'd be fired if I were to get pregnant (as I said before, we all know it's unethical but it doesn't stop it from happening), but I call myself a realist and can't shake these worries out of my head. Feel free to open fire on me as to why I'm "ignorant" and "anti-feminist" and if you can genuinely prove to me that none of the above things will happen then I am all ears. But just because something shouldn't happen or is technically illegal or discriminatory, doesn't mean that it won't happen either consciously or sub-conciously. 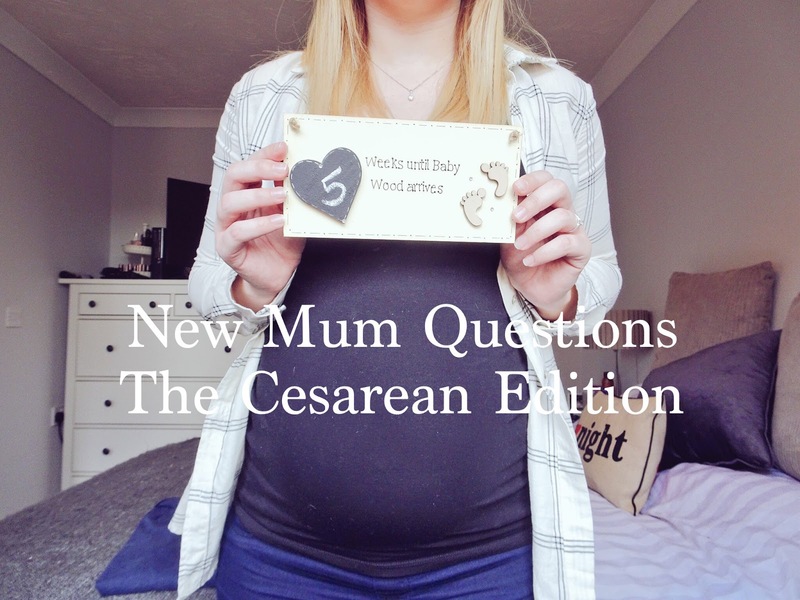 New Mum Questions Pt 4 - The Caesarean Edition! You can find the first three, more generalised New Mum Questions Posts here, here & here however as I'm nearing my due date I'm getting more and more curious/worried/anxious about the prospect of having a caesarean. It may not be an option for myself and quite frankly anything that gets her out safely is something that I want to do but I'd like a few things clarifying for my own piece of mind first. 1. Epidural - I've been advised that I may need an epidural from the get go, is this to be my aesthetic in case I need a caesarean or should it make a "natural" labour easier? I really wanted to do this with only the help of James and some Gas & Air so would rather wait for any pain relief for a caesarean until as and when I go in for one. 2. Cutting the chord - Can James still cut the chord if she's born via the caesarean? He says he isn't too bothered but I think he might regret it if he doesn't and could have. Obviously everything will be different if we have a caesarean so I'm unsure if it'll be an option. 3. Driving Off - As far as I'm aware you can't do anything for 6 weeks, how true is this? Obviously James needs to return to work before that time is up and we live around 20/30 minutes from our family, can I really not drive for 6 weeks? 4. Light Exercise - Similar to the question above really, I'm keen to start going for walks and taking Sophie swimming (only walking around in the water really) from as soon as possible. Is it strictly house-bound for 6 weeks or can I go for walks in the village and bob around the swimming pool with my new baby? 5. Belly Bandit - I'm also keen to use a Belly Bandit to try and reduce my Mum Tum ASAP. Can I still use this if I've had a Caesarean or will it interrupt with things/my scar? 6. Going Home - Essentially, how long will I have to stay in hospital after? 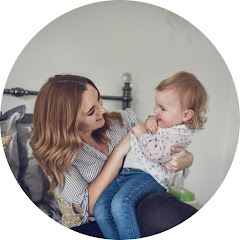 I know that a lot of these questions I need to ask my Midwife and Consultant (and believe me I will be doing) but I want some real life answer from Mummy's who have experienced it themselves.